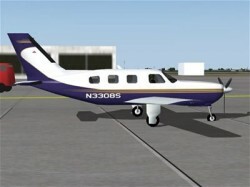 Description: Former payware aircraft that has been released into the public domain! Includes a simulated six-channel push-button AM/FM Radio for playback of music, recorded broadcasts and the like for ambiance and general entertainment while flying. The aircraft has a beautiful paint job but when you turn it on, tends to fall from the tail. Flying characteristics are to be improved. Nice model, beautiful to fly if you're impatient and want a plane that can approach at 250 knots and land on a dime. However, with that being said the flight dynamics are terrible! It also has incompatability issues with FS 2004 that can cause the application to become unstable (Most likely linked to the use of an older sound dll file). I don't really recommend this model. It's hard to install and isn't very realistic. Looks nice on the ground, but just doesn't cut it once you take it into the sky. Needs better flying characteristics.